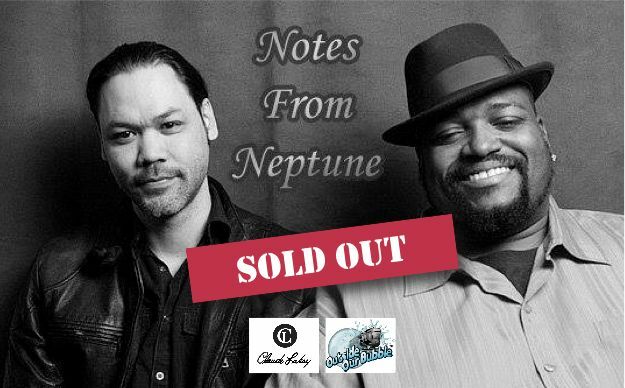 ​​All ticket holders will receive a special gift from Notes From Neptune at the performance. Scott is a guitarist of 30 years. Nylon string guitar is his preferred instrument. While playing some essence of classical and flamenco for the nylon string guitar he mixes in styles of pop, rock and jazz. His skills are breathtaking and when you listen, you are amazed at how easy he makes it look. You fall in a trance with watching his hands flow over his guitars with the grace and calm of the wind but the sound that you are trying to figure out “How is that even possible to move that fast?” On top of that, Scott also has a unique vocal sound you can’t miss. With a little mix of raspy yet classic smooth sound he sings many styles such as Sting, Pink Floyd and Harry Connick Jr. being some of his biggest influences. Thomas is a Saxophonist of 30 years. Alto sax is his most comfortable sax. But he does play Soprano and Bari sax. With the gospel styles of Kirk Whalum and the jazz styles of Stanley Turrentine in his background, he uses his sax as a voice and when you hear his sax it really speaks to you on a soulful level. He had a chance to play for an event where the Owner of Claude Lakey heard him. After getting to speak to him, Claude Lakey decided to have Thomas as a CL Endorser. But not only because he plays a great sax, by the way he’s been playing on Claude Lakey for the past 20 years, but Thomas brings a different element to the table. He also sings. But not only does he sing, but “He Can SANG!” With a voice smooth and warm as something you’ve only dreamed of and yet a familiarity that when you hear it, you can swear you’ve heard it before. Combined with his jazzy, gospel, spiritual sax, they take you musically to places that you have been waiting your whole life to go. Singing the styles of Bill Withers, Marvin Gaye, Ed Sheeren and Prince. Together they make up the band Notes From Neptune. Playing as a duo or a full band, this is what it feels like to jump on a rocket and blast off for a space journey where for a few hours your leave all your cares behind and close your eyes and see music completely different than anything your seen and heard before. They take songs you know, and songs that you’ve never heard of and allow you hear them for the first time all over again. You rarely get a chance to experience and even re-experience music the way Notes From Neptune plays it. It’s like reimagining music. I know once you hear it you will love it and also wonder what galaxy of music you will enter next.